Among the many atrocities revealed at Dr. Kermit Gosnell’s “House of Horrors” abortion clinic was that several of his staff members represented themselves as doctors although they had no medical training. A woman died and seven newborn babies were killed by infanticide in Dr. Gosnell’s abortion clinic. He is now serving three consecutive life sentences in prison for his role in the deaths. This week the Pennsylvania House of Representatives passed House Bill 587 to increase the penalty for those who commit the crime of impersonating a doctor. State Representative Matt Baker (R-Bradford, Tioga), prime sponsor of the bill, said, “Those in the medical profession are generally highly respected and trusted individuals whom people seek out when they are sick, vulnerable and looking for help. It is unconscionable that a person, for whatever reason, would pretend to be a doctor.” The legislation now moves to the state Senate. 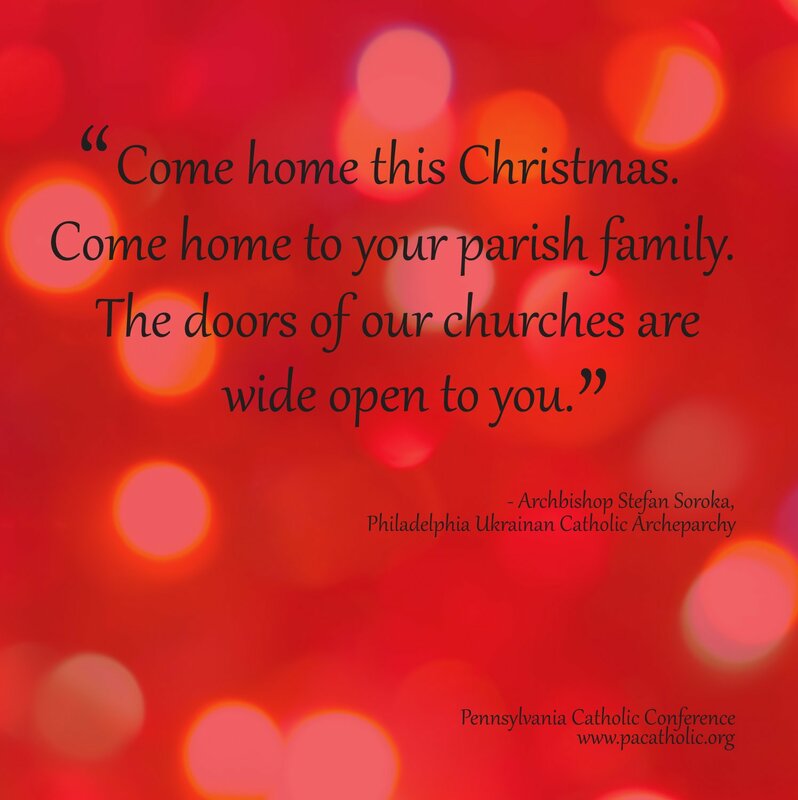 To learn more about Archbishop Soroka’s request to invite friends and family back to Church at Christmas, click here. Harrisburg, Pa., Dec 13, 2013 / 02:19 am (CNA).- Legislation introduced in Pennsylvania to prevent discrimination could end up prohibiting Catholic schools from requiring teachers to abide by Catholic teaching, religious freedom advocates in the state are warning. “The Church has been precise, in its moral teachings, in distinguishing between sexual orientation and sexual behavior. It has condemned all forms of hostility to any individual on the basis of her or his actual or perceived sexual orientation,” Amy B. Hill, communications director of the Pennsylvania Catholic Conference, told CNA on Dec. 11. Send a message to your legislators in support of religious freedom. If ever an image of love pierces one’s heart, it is probably that of Mary at the cross as her son was dying. At UPMC Mercy, there is a prayerful vigil with the dying in the No One Dies Alone program. “Only God knows when somebody is going to die. We don’t ever have it that precise. It can be challenging to anticipate the time. The role of this program is to attend the dying while they are here at UPMC Mercy when the family is not available,” said Denise Verosky, director of supportive and palliative care and a registered nurse of 35 years, who introduced the first program in Pittsburgh to the hospital. In 2008, Verosky became interested in the program after a colleague shared an article on No One Dies Alone in a nursing journal written by the founder, Sandra Clarke, a nurse at PeaceHealth Sacred Heart Medical Center in Eugene, Ore.
“Sandra’s story inspired me,” Verosky said. “Patients are dying all the time in acute-care hospitals. When a dying patient asked Clarke, ‘Will you stay with me?’ her answer was typical — ‘As soon as I check on all my patients.’ When she came back, his arm was outstretched and he had died.” Clarke went to the ethics committee, wrote a proposal and established No One Dies Alone. While working on a project in palliative care at Edinboro University and performing clinical hours with Mercy Sister Diane Matje, former director of palliative care, Verosky met with the mission council at the hospital to begin the planning process for No One Dies Alone. Phyllis Grasser, vice president of mission effectiveness and spiritual care, chaired the council and was involved with the implementation and start-up of the program in September 2010. Two additional members were added to the team: Maureen Kurp, a volunteer vigil coordinator, and Camillian Father Albie Schempp, a hospital chaplain. Currently, 30 volunteers from diverse faiths and backgrounds are “on call” as compassionate companions. Vigils are not to exceed two to three hours for each companion. So far, some 50 people have been assisted since the program’s inception. Permission is obtained from family members to provide the program. Volunteers carry a comfort case for use in the patient’s private room that contains flameless candles, rosaries, prayer cards, Bibles and prayer books for different denominations, and an iPod speaker system for instrumental Christian music. There are no efforts to baptize, evangelize or proselytize patients. This Sunday, as we light the rose candle on the Advent wreaths in our homes and churches, we will have a visual reminder that Christmas is drawing ever closer. We look ahead to the birth of a baby in a manger, the incarnation of our Lord, Jesus Christ. It is proper that we pause in silent wonder at this loving gift from our heavenly Father. At the same time, here at the New York State Catholic Conference, we must also look ahead, to the New Year and a new legislative session in Albany. This past year, thanks largely to your advocacy with your legislators, we defeated an insidious proposal pushed by Planned Parenthood and the National Abortion Rights Action League designed to dramatically expand late-term abortion here and to lower medical standards for women seeking abortions by allowing non-physicians to perform them. While we were victorious, it was a narrow win, with only one vote in the state Senate keeping this bill from becoming law. The abortion groups, which have a financial stake in pushing for as many abortions as possible, have spent hundreds of thousands of dollars to date in their attempt to get it passed, and they have pledged to fight just as hard in the coming session. We can never match their financial resources, but with the power of prayer and the united voices of Catholics and other pro-life New Yorkers across the state, we are confident we can hold it off again. At the same time, we will continue our efforts to enact passage of an Education Investment Tax Credit, to promote donations to scholarship funds for children in our Catholic schools and all schools in the state. We see this bill as critical to easing the financial burden faced by our tuition-paying parents, and we are getting closer than ever to victory. We will fight too for increased funding for programs that help people who are living in poverty as well as those who are old, infirm, mentally ill or otherwise vulnerable. To be successful in these efforts, it is imperative that we have the resources to continue to educate Catholic citizens on these issues so that they can take action with their elected officials. We do this through our Catholic Action Network, which sends you alerts and information updates throughout the year, and through our annual Catholics at the Capitol event with the New York State Bishops, to be held on Wednesday, March 19. Would you please consider a tax-deductible contribution at this time to help us with these important efforts? We hope to ramp up our network activities more than ever, but we need your help. Any amount, whether $5, $50 or $500, will be so valuable to us, the official public policy voice of Timothy Cardinal Dolan and the New York State Bishops. We are so grateful for your support and your prayers. May God grant you a Merry Christmas and a most blessed New Year. (2) The person would not commit perjury by declaring that he or she was never previously married. Although the attorney general declined to answer whether such a situated person who then married in North Dakota would be committing bigamy according to the laws of another state. By implication, however, it would seem that he or she would not be committing bigamy according to the laws of North Dakota. The opinion is an important affirmation of North Dakota’s recognition of marriage as only between one man and one woman. Regular visitors have read a lot about the way the HHS mandate impacts religious employers, like Catholic charities, hospitals and colleges. But what about small business owners who have religious objections to the mandate that says they must pay for contraception, sterilization and abortion causing drugs? A recent letter to the editor in the Harrisburg’s The Patriot News tells that story, “Forcing business owners to pay for employees’ abortions or other insensate procedures violates Americans’ rights to religious freedom. The nation’s founders did not exclude millions of individuals from religious freedom just because they worked in companies.” Read the entire letter here. And send a message in support of religious freedom by clicking here. The California Catholic Conference continues to advocate for the equitable access to a quality education for all California school children. Very early in 2014, two bills will be heard to increase support for students attending public, independent, and faith-based schools through the use of proven tax policy employed in many other states. SB 693 (Correa, D-Santa Ana) and AB 943 (Nestande, R-Palm Desert) address K-12 education needs by creating education tax credits or deductions that support parents and teachers in caring for their own school children’s learning needs and that encourage greater charitable contributions to expand local resources in K-12 education. These bills will be the subject of an Action Alert during the first week of the year. They were both part of last year’s Catholic Advocacy Day efforts. The equitable access principle also extends to students in high school and postsecondary learning. Two additional bills which we are supporting, SB 284 and SB 285 (De Leon, D-Los Angeles), will be re-introduced when the Legislature convenes. These measures would increase the Cal Grant B Access Award amount for California’s lowest income students. They aim to improve graduation rates through the use of state corporate tax credits that leverage federal tax deductions for charitable contributions. The language of both SB 693 and AB 943 is being modified prior to their respective hearings but you can read a summary here. Pope Francisâ€™ first message for World Day of Peace offers a profound challenge to all people to see each otherâ€™s humanity and pursue dialogue and peace over war and conflict, said the chairman of the U.S. bishopsâ€™ Committee on International Justice and Peace. Bishop Richard E. Pates of Des Moines, Iowa, welcomed the release of â€œFraternity, the Foundation and Pathway to Peace,â€� December 12. Which is more dangerous: tanning or abortion? All good. I have no beef with any of it. But come on! When was the last time New York City did anything about the unlicensed abortion clinics all over the five boroughs? Shouldn’t abortion facilities be held accountable to at least the same standards as tanning salons to protect the health and safety of women? Are routine inspections ever done to ensure trained staff, sanitary conditions, emergency back-up, and overall patient well-being? C’mon, New York City, we are better than that, aren’t we? Please, please enforce the law, inspect the clinics, provide necessary oversight, and safeguard vulnerable women. Tomorrow, December 12, is the feast of Our Lady of Guadalupe. Also called the “Patroness of the Americas,” this feast of the Blessed Mother provides us with an opportunity to focus on our shared Catholic identity, regardless of our national origins. In their pastoral letter Strangers No Longer (SNL) the Catholic bishops of the United States and Mexico noted that “under the light of the apparition of Our Lady of Guadalupe to the littlest of her children, who were as powerless as most migrants are today, our continent’s past and present receive new meaning. It was St. Juan Diego whom our Mother asked to build a temple so in it she could show her love, compassion, aid, and defense to all her children, especially the least among them. Since then, in her Basilica and beyond its walls, she has brought all the people of America to celebrate at the table of the Lord, where all his children may partake of and enjoy the unity of the continent in the diversity of its peoples, languages and cultures” (SNL, #20). The U.S. House of Representatives is currently considering whether to address immigration reform legislation that can provide significant relief to potentially millions of people and their families. Now is a critical time to contact your House members and urge them to pass common sense immigration reform. On this Feast Day of Our Lady of Guadalupe, you can join the U.S. bishops and other Catholics in this effort by clicking here to send a message to your member of Congress, asking him or her to pass just and compassionate immigration reform legislation. Pope Francis is both an effective preacher of the Gospel and also is non-judgmental, in the view of Stockton Bishop Stephen Blaire. Bishop Blaire reflected on the Pope’s leadership as part of a leadership class at Saint Mary’s College in Moraga. Blaire identified three strengths of the Pontiff that make him a strong leader. “The Pope certainly has that. He is able to take the truths of our faith and bring them down to our everyday experiences. Reflecting how Pope Francis’ style is impacting him, Bishop Blaire said “It is saying to me: am I exercising my ministry in a way that really communicates to people? that really brings the love of God to touch their lives in a very real way? “What the Pope is trying to get at is that you put the ethical and moral teachings in a context. The overriding context is of the love of God, the compassion of God, the dignity of the human person, the value of the other person. “And he makes the point that we have moral standards, but that does not give you the right to judge a person. Only God can judge a person. Bishop Blaire observed that throughout its history the Church has maintained “a sense of where people are, what they are going through. “ Pope Francis has that sense, in Bishop Blaire’s view. The discussion was the final event of a course on leadership brought in more than 25 leaders to reflect on leadership. Saint Mary’s College President James Donahue participated in the discussion. WASHINGTON—Archbishop Joseph E. Kurtz, president of the U.S. Conference of Catholic Bishops, welcomed the decision of Pope Francis to establish a commission on the protection of minors. The move was urged by the Council of Cardinals, an advisory group to the pope that met at the Vatican, December 3-5. Archbishop Kurtz praised the effort in a December 5 statement. The decision of Pope Francis to establish a commission for the protection of minors is a most welcome initiative. Abuse of minors is a sin and a crime, and every step must be taken to eradicate this blight. Such abuse is especially grave when committed by anyone in ministry in our Church. The problem of sexual abuse of minors exists throughout society and every effort must be made to protect children, particularly within the Church. The announcement of this initiative reflects a broad-based approach that considers changes in Vatican procedures in dealing with clerics accused of abuse, seminary training for future priests, and other pastoral efforts to address this horrific problem. This international effort is particularly welcome as we have come to learn that this tragedy affects many, if not all, parts of the world. As president of the U.S. Conference of Catholic Bishops, I promise full cooperation of the U.S. bishops with this commission and look forward to more information on its implementation. In the United States, we have learned of the importance of background checks, education of children and adults on child safety, the swift removal of offenders, and the need for the Church and civil authorities to work together. While these efforts have resulted in a dramatic reduction in abuse cases, much work remains to be done. Our prayers are with Pope Francis and this commission, and we are grateful for this effort. Bishop Jaime Soto of Sacramento has been elected by his brother bishops to lead the California Catholic Conference (CCC) – the public policy arm of the two Archdioceses and 10 Dioceses in California. Bishop Robert McElroy, auxiliary bishop of the Archdiocese of San Francisco, was elected Vice President of the Conference, and Bishop Richard Garcia of Monterey was re-elected as Treasurer. Bishop Soto succeeds Bishop Gerald Wilkerson, auxiliary bishop of the Archdiocese of Los Angeles, and begins a three-year term as the Conference president. “Gathering together as a Conference of Bishops helps us address those inequities at the local and state level as well as provide teaching, resources and support to Catholics in California committed to justice,” he said. The California Catholic Conference (CCC) is the official voice of the Catholic community in California’s public policy arena. Its mission is to advocate with the legislative, administrative and judicial branches of state government for the Catholic Church’s public policy agenda and to facilitate common pastoral efforts in the Catholic community. The CCC also enables ecumenical and interfaith dialogue and action. The Advent and Christmas seasons are great times to reflect on the lives of the Holy Family and how they relate to Godâ€™s concern for the poor, justice, and human life. Central to the Church is her concern for the poor and the marginalized. The Holy Family was most certainly poor, even by the standards of their time. The sacrifice offered at the presentation in the temple was one prescribed for poor people. Nazareth and Bethlehem were not centers of wealth. Our Godâ€™s closeness to the poor is also expressed by the fact that our Lord was born in a stable. The infancy narratives contain other examples of the Holy Familyâ€™s lowliness and marginalization, as well as special concern for justice. Maryâ€™s Magnificat praises God because he exalts those of low degree, fills the hungry with good things, and sends the rich away empty. They lived in a conquered nation subject to the whims of the often brutal Roman empire. They were Jews in a pagan world. They were homeless, with no room at the inn. Jesusâ€™ first visitors were shepherds, who at that time were considered dirty outcasts. Mary and Joseph most likely experienced first-hand what it is like to be subjected to ridicule and rejection. We know in hindsight the circumstances of Jesusâ€™ conception, as did Mary and Joseph. Those around them, however, probably saw only a girl who conceived out-of-wedlock and a man who was willing to bring shame on himself by marrying this â€œfallenâ€� girl. Although they committed no sin, we can be assured that they hear the prayers and feel the pain of those ostracized and feeling alone. The innate dignity of all human persons is, of course, brought forth in the lives of Mary and Joseph, but it can also be seen in others in the infancy narratives. We live in a society that often marginalizes the old. At Jesusâ€™ presentation in the temple we see the prophetess Anna. Working from Lukeâ€™s text, some scholars conclude that she might have been 105 years old. Elizabeth and Zachariah were old, at least beyond child-bearing years. Yet God answers their prayersand they conceived John the Baptist. John the Baptistâ€™s story demonstrates the dignity of the human person at the other end of the spectrum. When Mary, bearing Jesus, visits Elizabeth the babe â€œleaped in her wombâ€� and she was filled with the Holy Spirit. Note to abortion advocates: clumps of tissue do not leap or receive the Holy Spirit. After Jesusâ€™ birth, the Holy Family again experiences some of the same pains and trials experienced by people today. Like refugees fleeing places like Syria and Somalia, the Holy Family was forced to leave their homeland for Egypt. They became immigrants, aliens in an strange land. The massacre of the children by Herodâ€™s men that followed should remind us of the children today who are killed by war, terrorism, and abortion. We usually gloss over these facts when remembering Christmas. Our Christmas cards and nativity scenes present an ideal pastoral image rather than the aesthetic ugliness of poverty. We sanitize the portrayal so we are left only with the Holy Familyâ€™s humility. They truly were humble, but their humility and faithfulness should not cause us to lose sight of their plight. Nor should we twist the scriptures to conclude that because Mary and Joseph did not complain the poor should â€œbuck upâ€� and accept what is dealt them. On the contrary, because Jesus, Mary, and Joseph were poor, we need to help the poor. Because they were immigrants, we need to welcome the immigrant. Because they were human persons, we should protect and embrace all human life. The faithful of the state of North Dakota are invited to pray a Novena to Our Lady of Guadalupe, December 4 â€“ 12.Â On December 11, the eve of the Feast of Our Lady of Guadalupe, the North Dakota Supreme Court will hear oral arguments in a case that could determine the fate of North Dakotaâ€™s pro-life laws.Â Abortion proponents are asking the court to find that the North Dakota Constitution provides a â€œfundamental rightâ€� to abortion.Â If the court agrees, all of the stateâ€™s laws to protect life, family involvement, and womenâ€™s health would be in jeopardy.Â Â Please join us as we implore the intercession of the Patroness of Unborn Children to protect our current state laws and pray for all those involved with this court case. Virgin of Guadalupe, Patroness of unborn children, we implore your intercession for every child at risk of abortion. until God calls them home.Â Help us never to see others as burdens.Â Guide our public officials to defend each and every human life through just laws. Inspire us all to bring our faith into public life, to speak for those who have no voice. We ask this in the name of your Son, Jesus Christ, who is Love and Mercy itself.Â Amen. Pope Francis is leading the world to deeper faith, and the U.S. bishops look forward to sharing his words in their dioceses, said the chairman of the Committee on Evangelization and Catechesis of the U.S. Conference of Catholic Bishops. Bishop David L. Ricken of Green Bay, Wisconsin, welcomed the release of Evangelii Gaudium (The Joy of the Gospel), the popeâ€™s post-synodalÂ apostolic exhortation to 2012â€™s Synod of Bishops on the New Evangelization. â€œI invite all Christians, everywhere, at this very moment, to a renewed personal encounter with Jesus Christ, or at least an openness to letting him encounter them; I ask all of you to do this unfailingly each day,â€� Pope Francis wrote in the opening of the document. The pope presented the exhortation over the weekend in Rome, at events commemorating the end of the Year of Faith, which began October 11, 2012. It is the popeâ€™s official response to the discussions held as part of the Synod of Bishops on the New Evangelization, which occurred October 7-28, 2012, in the Vatican. Bishops from around the world gathered to discuss how the Catholic Church can renew the energy of Catholics, strengthen their faith and better share the Gospel with the rest of the world. The Synod of Bishops is an international gathering of Catholic bishops, convened every few years for discussion and to advise the pope on specific concerns related to the Church and the world. It was first convened by Pope Paul VI in 1967 and has subsequently met to discuss Scripture, the Eucharist, priesthood, the laity, pastoral circumstances in different regions of the world and other topics. Pope Francis has announced an Extraordinary Synod on Pastoral Challenges to the Family in the Context of Evangelization, to be held in October 2014, followed by an Ordinary Synod on the same topic in 2015. With the roll out of the Affordable Care Act (ACA) well underway, some states are making headlines because of the inclusion of elective abortion coverage in their plans. In Pennsylvania, thanks to the passage of House Bill 818 in June, no elective abortions can be covered in the plans available via the state exchange (which is run by the federal government in Pennsylvania). As far as private plans available outside the exchange, the Abortion Control Act passed in 1982 requires that insurance providers offer at least one plan that does not include elective abortion coverage. WASHINGTON—Archbishop William E. Lori of Baltimore, chairman of the U.S. Conference of Catholic Bishops’ (USCCB) Ad Hoc Committee for Religious Liberty, welcomed the U.S. Supreme Court’s decision today to hear arguments in the cases of Hobby Lobby Stores, Inc. and Conestoga Wood Specialties. The U.S. government and the Hahn family, Mennonite owners of Conestoga Wood, a cabinet-making company, respectively, petitioned the Supreme Court to review these cases. The Court will consider the legality of the U.S. Department of Health and Human Services (HHS) “preventive services” mandate, which requires virtually all employers to include female sterilization and all drugs and devices approved by the U.S. Food and Drug Administration (FDA) as contraceptives in their employee health care plans. These cases are among at least 84 lawsuits filed by over 200 plaintiffs against the HHS mandate. A preliminary injunction was granted to the Catholic Dioceses of Pittsburgh and Erie, Catholic Charities agencies and other affiliated Catholic non-profits. On January 1, 2014, the agencies do not have to comply with the Department of Health and Human Services (HHS) mandate that would force Catholic employers to buy coverage for sterilization and contraceptives, including drugs that induce abortion. This is a significant victory for religious liberty, but the issue is not yet resolved. Dozens of other cases throughout the United States are still pending. It is likely one of more of the cases will come before the U.S. Supreme Court. Concerned Catholics are also pressuring Congress to pass legislation to remedy the situation. Send a message in support of religious freedom through the Catholic Advocacy Network here. Read the statement from Pittsburgh’s Bishop Zubik here. On November 13, the Pennsylvania Senate unanimously passed a resolution recognizing the good work of the Pennsylvania Catholic Health Association (PCHA) and honoring its 50th anniversary.